I have a great grilling recipe for you this weekend! These were some of the tastiest pork chops I have ever had. They were very moist and the flavor was incredible. Grilling them gave them a little char, which was an excellent touch. My only recommendation is to make sure you use low sodium soy sauce. If you use regular soy sauce, the marinade might be too salty. So just do that and you'll be set! Combine the soy sauce, water, sugar, ginger and garlic in a large food storage bag. Add pork chops; seal and turn from side to side to coat chops. Place in refrigerator and marinate for 1 hour, turning several times to coat pork. Preheat grill to medium-high heat. Shake pork chops of excess liquid and grill for about 4-5 minutes per side, or until cooked through. Meanwhile, pour marinade in a small saucepan. Cook until boiling, and then continue boiling for 5 minutes. 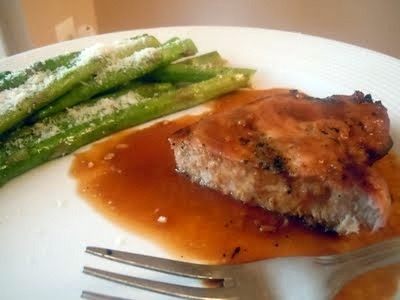 Top pork chops with sauce. Enjoy!